Hypertension episodes of adrenal cortical oncocytoma mimicking pheochromocytoma attacks. Citation: Onan E, Paydas S, Bagir E, et al. Hypertension episodes of adrenal cortical oncocytoma mimicking pheochromocytoma attacks. J ortho Rehab Surg. 2017;2(1):19-21. Catecholamine-secreting tumors which are derived from chromaffin cells in adrenal medulla are called pheochromocytoma. The ratio of pheochromocytoma in all hypertensive patients is less than 0.2%. Adrenal oncocytomas can mimic the clinical features of pheochromocytoma. We aimed to present the findings of 2 patients with adrenocortical oncocytoma resembling pheochromocytoma. Adrenocortical oncocytomas have rarely been reported on in the medical literature, and most of them have been nonfunctional and benign. Although spontaneous extensor tendon rupture often occurs in association with rheumatoid arthritis, extensor tendon rupture associated with osteoarthritis of the distal radioulnar joint has been rarely reported. A 43-year-old female patient was admitted to emergency department with high blood pressure in September 2014 and to neurology intensive care unit with right hemiparesis, loss of vision in November 2014. She had been discharged with antihypertensive therapy when radiological imaging and laboratory tests were both normal. Despite regular antihypertensive medication her blood pressure was irregular and she was hospitalized at nephrology department in October 2015. She had hypertension otherwise physical examination was normal. She was explored for high blood pressure, and high serum norepinephrine, 24-hour urine normetanephrine levels. Serum ACTH levels were suppressed and cortisol level was slightly increased. Magnetic resonance imaging of pituitary gland was normal. Adrenal magnetic resonance imaging revealed 52 × 38 mm adrenal adenoma (Figure 1). She had been operated. Pathology of adrenal adenoma was consistent with adrenocortical oncocytic neoplasm (Figure 2). 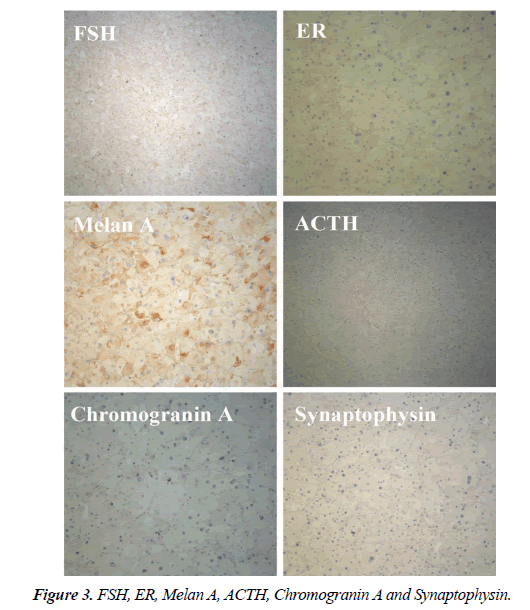 Immunohistochemical method revealed positivity for melan A and negativity for chromogranin, synaptophysin, FSH, ER and ACTH (Figure 3). After surrenalectomy patient’s blood pressure did not reduce and she had menorrhagia. Gynecological examination and endometrial biopsy revealed endometrial adenocarcinoma. She had total abdominal hysterectomy and bilateral salpingoooferectomy. She is still having outpatient follow-up. Figure 1: A ad. eMnoamga nate letftic s urreresnoaln galanndc).e imaging of piuitary gland B. 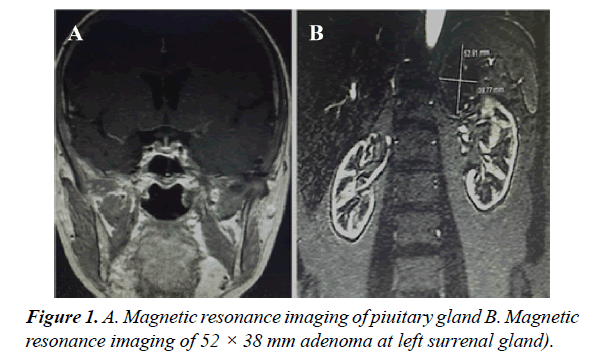 Magnetic resonance imaging of 52 × 38 mm adenoma at left surrenal gland). Figure 2: disrupted with a thin fibrous cap from lesion and there is an infiltration to adrenal gland (H&Ex40). B. Next to cells that have oncocytic appearance with large eosinophilic cytoplasm and vesicular nucleus, in some areas there are pleomorphism with extensive granular cytoplasm (H&Ex200). C. In examination of endometrial sample there is grade 1 endometrioid adenocarcinoma consisting atypical glandular structure (H&Ex100). Figure 2. A. Histological sections prepared from the left adrenal gland showed normal adrenal tissue is disrupted with a thin fibrous cap from lesion and there is an infiltration to adrenal gland (H&Ex40). B. Next to cells that have oncocytic appearance with large eosinophilic cytoplasm and vesicular nucleus, in some areas there are pleomorphism with extensive granular cytoplasm (H&Ex200). C. In examination of endometrial sample there is grade 1 endometrioid adenocarcinoma consisting atypical glandular structure (H&Ex100). Figure 3: FSH, ER, Melan A, ACTH, Chromogranin A and Synaptophysin. A 62-year-old male patient had type-2 diabetes for nine years and hypertension for twelve years. He had unregulated blood pressure with routine antihypertensive drugs and was investigated at another hospital. MRI of abdomen revealed an adrenal adenoma at a diameter 40 × 30 mm on his left adrenal gland. He was operated on July 2015. But pathological examination did not reveal the diagnosis. After operation he still had hypertension. And he arrived to our nephrology department. He had hypertension and physical examination was otherwise normal. Laboratory showed slightly decreased potassium level. But his serum ACTH, cortisol, renin and aldosterone levels were both normal. 24 hour urine samples showed increased normetanephrine (Table 1). Specimens of adrenal gland were reevaluated at our pathology department and adrenal adenoma was consistent with adrenal cortical oncocytic adenoma and amyloidosis (Figure 4). Figure 4: A. Histological sections prepared from the left adrenal gland shows normal adrenal tissue is disrupted with a thin fibrous cap from lesion and there is an infiltration to adrenal gland (H&Ex40). B. Neoplastic structure that has oncocytic appearance with large eosinophilic cytoplasm and vesicular nucleus (H&Ex200). C. The kidney biopsy showed 5-6 glomerulus and there is complete sclerosis at 4 glomerulus and there is segmentary homogenous hyalinized material at 2 glomerulus (amyloidosis). BUN: Blood Urine Nitrogen, Na: Sodium, K: Potassium, ACTH: Adrenocorticotrophic hormone, VMA: Vanile mandelic acid. Table 1. Pre-operative and post-operative parameters of patients. Adrenal oncocytomas are very rare. There is female predominance with a median age of 46 years. Our patients were forty three and sixty two years old respectively. These tumors are more common on the left side [1-5]. Most of these tumors are nonfunctional. Tumor size ranged from 3-15 cm; with a median of 8 cm. Oncocytomas are generally benign tumors. The Weiss system is most popular for distinguishing benign from malignant adrenocortical neoplasm6. Grossly these tumors are rounded, well-circumscribed and encapsulated. A cut section shows tan brown color with areas of hemorrhagic necrosis. Histologically, these tumors contain cells arranged in solid, tubular, papillary, or trabecular patterns [3,4]. Cells are strongly eosinophilic and granular, due to the presence of numerous mitochondria . Two adrenal oncocytoma patients had resistant hypertension in postoperative period and their clinical, imaging and laboratory findings resembled pheochromocytoma. In the literature there was presented adrenal cortical oncoytomas mimicking pheochromocytoma. At case 1, serum ACTH level was suppressed and serum cortisol level was slightly increased (only 5 μg/dL). Her appearance was consistent with neither Cushing’s disease nor Cushing’s syndrome. Other pituitary gland hormones were in normal range, MRI of pituitary gland was normal. In preoperative period she had hypertension attacks and serum norepinephrine levels were increased but this situation persisted despite development of adrenal insufficiency after left surrenalectomy. On the other hand in post-operative period 24-hour urine normetanephrine levels were higher than the upper range. Post-operative sintigraphic examination for pheochromocytoma was negative. In case 2 he had hypertension, serum norepinephrine levels were slightly increased and his serum ACTH/cortisol levels were within normal levels in preoperative period. In postoperative period he still had hypertension and 24 hour urine normetanephrine levels were slightly increased. Pathological diagnosis of adrenal adenomas (Cases 1 and 2) was consistent with adrenocortical non-secretory oncocytic neoplasm. Because immunohistochemical method revealed positivity for melan A and negativity for chromogranin, synaptophysin, FSH, ER and ACTH. After surrenalectomy patients were treated with antihypertensives but hypertensive attacks did not developed during follow up period. While amyloidosis in oncocytoma and renal specimen was positive in case 2 but negative in case 1. Case 1 was also operated for endometrial adenocarcinoma. Pathologically these metachronous tumors were different each other [5,6]. Immunohistochemical studies are helpful in distinguishing such cases as pheochromocytomas are positive for chromogranin A and other neuroendocrine markers . Electron microscopic studies will reveal dense-core membrane-bound granules in the cells of pheochromocytomas . In summary we presented two cases with hypertension and adrenal cortical oncocytoma mimicking pheochromacytoma. Amyloid deposition was found positive in one of them. After removal of these nonfunctional oncocytoma hypertension was continued less severely in our cases. Stein PP, Black HR. A simplified diagnostic approach to pheochromocytoma. A review of the literature and report of one institution's experience. Medicine (Baltimore) 1991;70: 46. Pacak K, Linehan WM, Eisenhofer G, et al. Recent advances in genetics, diagnosis, localization, and treatment of pheochromocytoma. Ann Intern Med 2001;134:315. Kiriakopoulos A, Papaioannou D, Linos D. Adrenal cortical oncocytoma mimicking pheochromocytoma. Hormones 2011;1:76-79. Chang A, Harawi SJ Oncocytes, oncytosis and oncytotic tumors. Pathol Annu 1992;27:263-304. Hamperl H. Onkocytes and the so called hurthle cell tumor. Arch Pathol 1950;49:563-570. Weiss LM, Medeiros LJ, Vickery AL Jr. Pathologic features of prognostic significance in adrenocortical carcinoma. Am J Surg Pathol 1989;13:202-206. Llyod RV, Blaivas M, Wilson BS. Distribution of chromogranin and S-100 protein in normal and abnormal medullary tissue. Arch Pathol Lab Med 1985;9:633-635. Sharma N, Dogra PN, Mathur S. Functional adrenal oncoytoma: A rare neoplasm. Indian J Pathol Microbiol 2008;51:531-533.